Tourism is one of the largest industries in the City & County of Denver, and in the State of Colorado. Visitors stimulate the local economy and benefit hotels, meeting facilities, attractions, restaurants, cultural institutions, tour companies, transportation providers, local farmers, and countless other businesses. Without dedicated funding from local and state governments to promote tourism, its economy shrinks - fewer people come to visit, reducing the money that enters our economy. Tourism Pays for Denver. Tourism is one of the largest industries in the City & County of Denver. Tourism is one of the largest industries in the State of Colorado. The U.S. Travel Association (USTA) is the unique national organization that leverages the collective strength of those who benefit from travel to grow their business. Learn about higher education hospitality programs, scholarships, and career opportunities. For more information about the travel and tourism industry, or to find more data about the impacts of tourism on the economy, please use these resources. Policy Perspectives is a quarterly policy e-newsletter highlighting local, state, and federal issues impacting the tourism and hospitality industry. 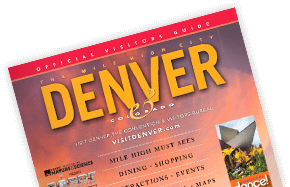 Tourism Pays was developed by VISIT DENVER, The Convention & Visitors Bureau, the official Destination Marketing Organization (DMO) for the Denver Metropolitan Area.